Speaking of this, Fruttare is giving you guys tons of surprises at Lot10 now! Fruttare will be giving you guys a refreshing and invigorating burst of surprise at Lot 10, Jalan Bukit Bintang from 16th June – 8th July 2012. How to get Fruttare Surprise? It's easy! 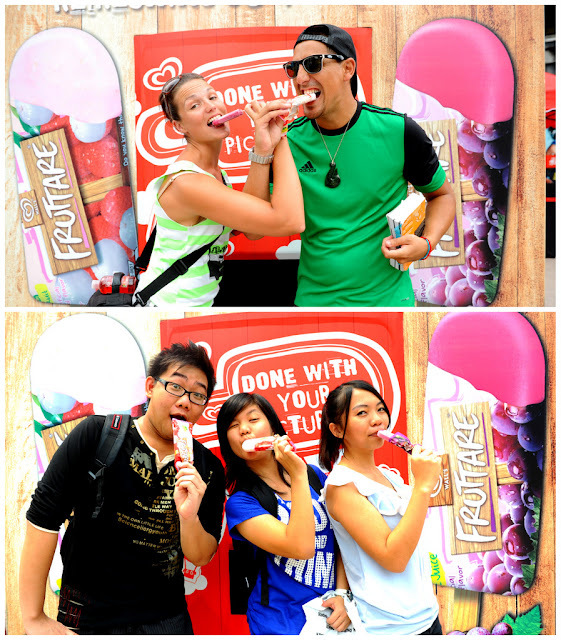 Just snap a picture at the "Fruttare Giant Kiosk", share it on FB and get a Fruttare Surprise. It is not just a little surprise as you can win awesome prizes such as "YES 4G Mobile Broadband", multi-coloured iPods and so much more! First, snap a photo of yourself at Fruttare’s Surprise Giant Kiosk @ Lot10 to enjoy a refreshing surprise! All you need to do is snap a photo of yourself at Fruttare’s Surprise Giant Kiosk @ Lot10, share the refreshing experience on your Facebook page, and enjoy a refreshing surprise (awesome prizes awaiting you!) that’s perfect on a hot sunny afternoon! Could it be the latest iPod? Some of the happy faces with their happy surprise! Fruttare has 2 different flavor which is Red Grape and Lychee! Try them out and tell me which one is your favourite! Let's visit Fruttare's Giant Kiosk @ Lot10 today! Quick! From now until 8th July 2012 only! Let's beat the heat with Fruttare! !